The photo has an interesting history. When we first met Phil Smith in 1997, we showed him the print. 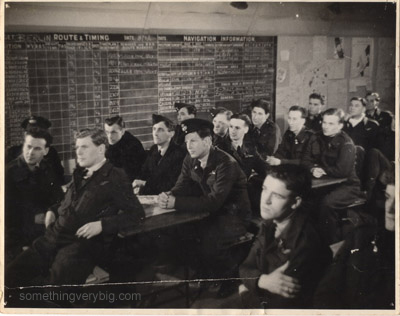 He turned it over – and immediately recognised his own handwriting on the reverse, naming the three members of his crew sitting at the back of the group. But there is an intriguing inconsistency in the photo. At close inspection, the date on the blackboard at top left reads 11 March. The target is given as Berlin. But in neither Jack’s nor Phil’s logbooks is there an operation recorded on that date – to anywhere, let alone to the ‘Big City’. In fact, neither logbook records any flying of any kind on that day. Perhaps, we thought, the briefing had been for an operation that was subsequently scrubbed. As it turns out, the real answer is even better. Also appearing in the photo – the man in the centre wearing the officer’s hat – is Dan Conway, an A Flight skipper. After the war he wrote a superb book called The Trenches in the Sky, in which he explained the situation. A film unit was visiting Waddington to take shots for a short feature called The RAAF in Europe. The briefing was staged for the benefit of the cameras and, according to Conway, included “references to tracking at low level over the Ruhr etc. Maybe because we were laughing [the CO] was made to go through the procedure again and then again…” (C07-014-160). The photo is in fact a still taken from that film. Our copy has a purple stamp on the back saying “RAF Photographic Section”. So how did this official photo end up in Jack’s collection? Phil Smith had much extended family in England and his letters reveal that he visited them often while on leave. One uncle was Jack Smeed, who worked for a film studio in London… and it was this studio that produced the film from which the photograph was pulled. It appears that Jack Smeed arranged for copies to go to Phil, who captioned them and then forwarded them to his parents. After the crew went missing, Edward Purcell’s letters from late 1944 show that Don Smith spread them around to the families of some of the rest of the crew. A few years before he died, Phil Smith was visiting the Australian War Memorial with his wife Mollie. In a corner of the Second World War gallery at the time was a small Bomber Command display, which included a short film. It was a grab from The RAAF in Europe, and Phil recognised himself as one of the reluctant film stars in it. I remember seeing the same display myself some years later (edit September 2013: it’s still there! ), and the footage still crops up occasionally in documentaries and the like. “I promise that if you had witnessed normal Mess night booze up “goings on” during stand-downs then you would think that we were all ‘Flack Happy'” – Dennis Over, 227 Sqn rear gunner (C03-021-020). We had a party in the mess last night to wish him farewell. It was a very noisy and rowdy affair but quite good fun. It ended up with us all, including the C.O, with our coats off, cockfighting and wrestling on the floor. (A01-207-001). As Phil wrote in his usual understated way in his diary the next day, “Good fun but not very dignified” (B03-001-001). The Chief Instructor + my old flight commander and some others came over from Honeybourne to pay a friendly call. We ended up by returning the compliment – to liven up their mess. It resulted in a certain amount of broken furniture cups and glasses…. The met man had quite a brawl with the chief bombing leader up in the rafters like monkeys (A01-296-002). Most of us used to drink a pint or two every night but on party nights it was almost obligatory to become legless! Those who stayed home in the mess – read books, wrote letters home every night – for some reason or other seemed to be the ones that got shot down early’ […] others, a little bit wild like myself, seemed to be the ones who lived. (C07-044-001). Following the ANZAC Day march in Sydney this year, Don beat all of us to the bar.